While running your cell phone repair business you may encounter situations when some of the stock you purchased from your vendor turns out to be faulty or broken. In repair industry such occasions are inevitable and there is a need for an efficient procedure by which purchasers can exchange faulty parts for working parts from their vendor. To address this need of yours we have introduced RMA or Return Merchandise Authorization module of RepairDesk. Within a couple of clicks you can send an RMA to your vendor with details to ensure that you get working parts or refund in exchange for returning faulty ones and add credit notes against vendor. There are many ways in which you can draft a RMA and send it to your supplier. All of your RMA requests will be listed on RMA section page. From this page you can view all the details about various RMAs, create one or perform actions such as edit, delete. clone, or add a refund/ credit note. In the RMA section of RepairDesk, click on Create RMA button to generate a RMA. You can also manually create RMA by heading to Inventory tab and clicking on the Add button next to RMA. It will take you to a screen where you can draft a RMA from scratch. Request For - Here you can mention what you want in return of items i.e. refund, Add credit note etc. Status - Status of RMA i.e. In Progress, Sent to supplier, Refunded etc. Click on Add Row button to add an item to RMA. To remove an item click on Delete icon next to the line item. Once you have entered all details, click on Save to create a RMA. Suppose you have used a part in a repair and its not working. In this case a part would be assigned in the repair ticket. You can easily send an RMA directly from a ticket by selecting the part's warranty. To know how to create an RMA from tickets, click here. You can add a refund or credit note for any RMA in RepairDesk. Simply click on the Action button in front of an RMA and select Add Refund/ Credit note. When you add a refund this means that supplier has refunded the specific amount to you against the RMA. To add a refund, simply click on the Action button in front of an RMA and Add Refund/ Credit note. Notes - Additional description about refund or credit in Notes. Once a credit note is added, a particular amount is added in supplier details under settings. Credit note amount can be used in PO for the same supplier in next purchase. To add a credit note, simply click on the Action button in front of an RMA and select Add Refund/ Credit note. Credit Notes can be viewed from supplier details by going to settings and clicking on suppliers. You can see the list of suppliers along with credit notes. These notes can be used next time when you are purchasing something from the same vendor by adding them to a PO. Q. Is it possible to merge multiple RMA into a single one? A. No. Such functionality is not available in RepairDesk. Q. How can I create a RMA for a repair part directly from the Ticket page? A. You can create RMA directly from tickets in RepairDesk. Learn how to do so from here. Q. How can I use a credit note? A. 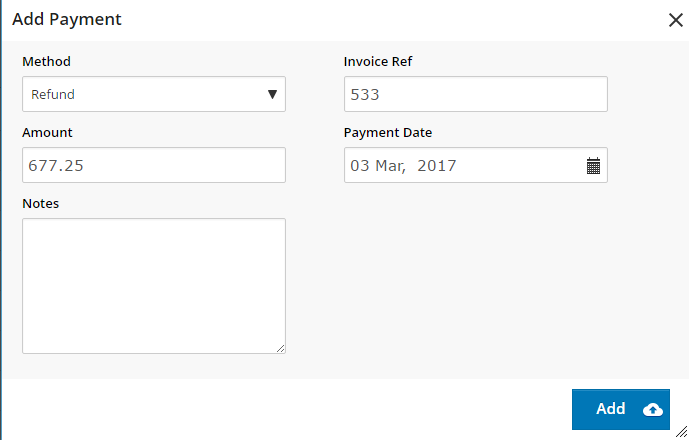 You can utilize a Credit Note while creating a purchase order. 2. Select Supplier from the drop-down menu. 3. 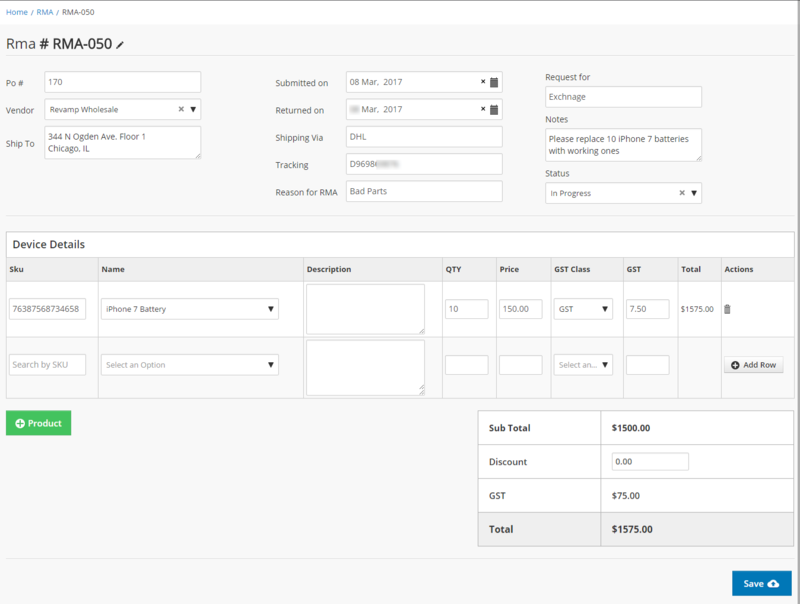 Once you have selected the supplier in a PO, head to the subtotal section. 4. 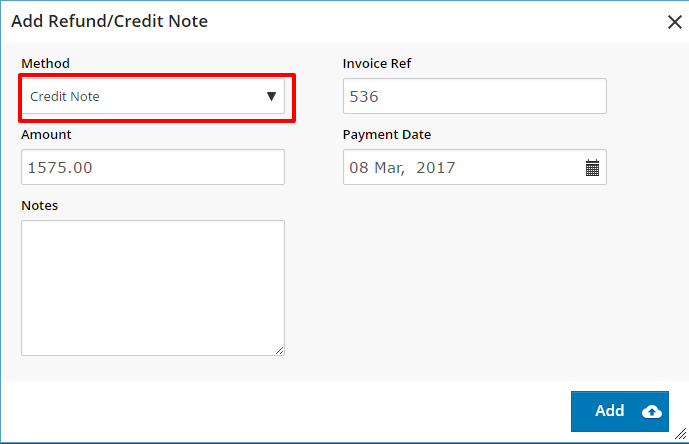 Under credit notes, select amount of credit note previously added against the supplier. 5. Finally, click on Save to add PO. Q. Where can I view Credit Notes? A. You can view them in Supplier Details under Settings. Q. How can I create RMA for serialized inventory item? A. While creating RMA for serialized inventory item, either through warranty claim or refund, in both cases it will ask you to select serials that you want to return. On selecting serial, its details will be shown up in description field. Please note that on returning a serial, its status will be marked as In RMA and stock against that serial will not be deducted till its status is marked as sent to supplier. Q.can I set default tax for RMA? Set default tax for RMA. 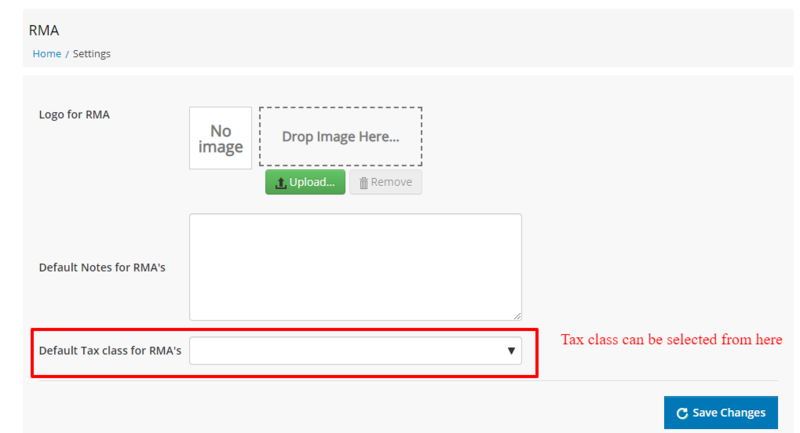 All the tax classes will be populated which are already created in the system.